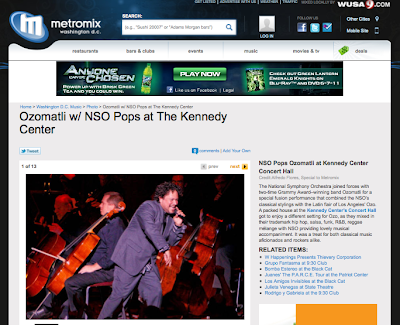 The National Symphony Orchestra joined forces with two-time Grammy Award–winning band Ozomatli for a special fusion performance that combined the NSO’s classical stylings with the Latin flair of Los Angeles’ Ozo. A packed house at the Kennedy Center’s Concert Hall got to enjoy a different setting for Ozo, as they mixed in their trademark hip hop, salsa, funk, R&B, reggae mélange with NSO providing lovely musical accompaniment. It was a treat for both classical music aficionados and rockers alike.